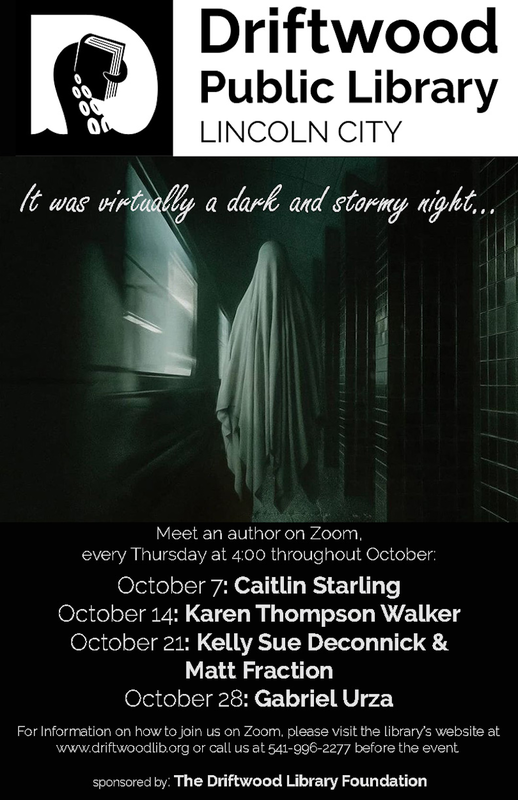 As the days darken and the weather cools, Driftwood Public Library invites you to join our Autumn author series. In October 2002, Driftwood Public Library teamed with the late Marcy Taylor, a retired Lincoln County educator and a passionate, life-long fan of mystery novels, to bring Northwest mystery writers to the Oregon coast. The program was called “Dark & Stormy Night”. That first year was so successful that the series has continued every October, with only one break while the library was closed for its renovation in the Autumn and early Winter of 2009. The series has evolved to include writers of other genres, but the spirit remains the same: to bring readers and writers of stories best enjoyed in the darkening days of October together. Dark and Stormy Night 2018 Press Release. Larry Brooks, Nancy Bush, Chelsea Cain, Bill Cameron, Carola Dunn, Elaine Flinn, Dana Haynes, Lisa Jackson, Jack Judge, Amanda Lee, Kenneth R. Lewis, Ann Littlewood, Doc Macomber, Phil Margolin, Sharan Newman, Gregg Olsen, Barbara Pope, Mary Rosenblum, Mark Schorr, Johnny Shaw, Heather Sharfeddin, Shirley Tallman, Andrew Vachss, Susan Wingate, Barbara Workinger, Lono Waiwaiole, Chriistina York.